Glorious crystal colours dear Leovi! Evoca draghi, misteri, creature buone ma inquietanti, passato che ritorna e si mimetizza da presente. De hecho el 27 de marzo del 2013, por obra tuya, Rocinante voló, Leovi y ese es un capítulo que seguro está presente en esa secuencia de la que hablaba. ahhh...how beautiful....of course, I am so simple, I see a beautiful fish. ¡Pobre Rocinante! pero tiene una bonita agonía, es más, si tuviese que elegir una de las tres, me quedaría con todas. Para cambiar el estado de ánimo, me conté un chiste. Brilliant! Has almost a liquid feel to it. Al atardecer un buen momento para morir. No lo puedo remediar, tengo predilección por estas fotos. Atractiva en composición y color. Buen trabajo. Juncal creo que Esperanza Aguirre aun no ha digerido el voto de 519.210 madrileños! Que buena memoria tienes Juncal! Para un caballo que vuela que mejor final! It reminds me of a peacock. love the fluid shapes! and colours! and clouds! beautiful! They are lovely to see. Bom dia, seu magnifico trabalho merece o sucesso com boa vendas. Siempre te digo lo mismo pero es que estos paisajes de cristal me encantan. this design somehow reminds me of your previous work..but brilliant colors as always.. This is so beautiful that it is breath taking !!!! Every pic has something to ponder over. Thanks for linking in with Friday My Town Shoot Out. 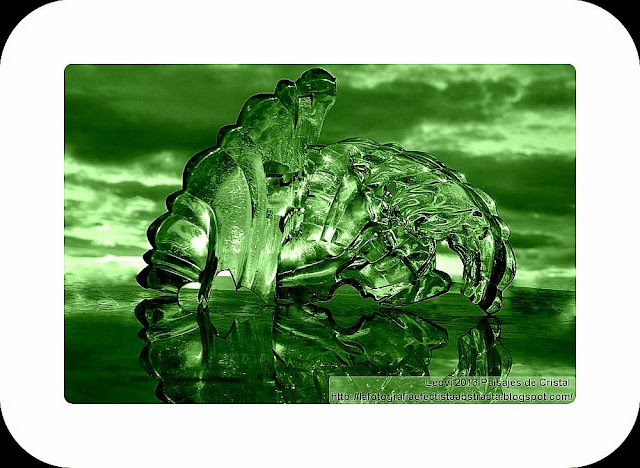 Beautiful crystal landscape, I love the first color image. Happy Friday, have a great weekend! Wonderful dear Leovi .... The picture is so colourful and gives a good mood. Very beautiful contrast and reflections. Lovely shapes. oh how beautiful! I love the vibrant yellow peeking through. Another glorious combination of colors. Absolutely gorgeous abstract picture! Wonderful reflections and colours! That first one is STUNNING! Great job! Thanks for joining us for #PhotoFriday! Gorgeous! I love the bit of transparency. Almost looks like some magnificent creature that stepped out of the ocean. Thanks for sharing with SYC. As always, your beautiful artwork fills my eyes. Such lovely work. I love the colors of the sunset streaming through the crystal… beautiful Leovi! Wow, this has lots of fantastic colors combined. Such an amazing job! Thanks a lot of blessing us with your entry this week at Word Art Wednesday. Make sure to stop by and join us again in another Challenges starting tomorrow. Leaving you with God's Word in Colossians 3:23-24 which says, "Whatever you do, work at it with all your heart, as working for the Lord, not for human masters, since you know that you will receive an inheritance from the Lord as a reward. It is the Lord Christ you are serving." Have a blessed day!